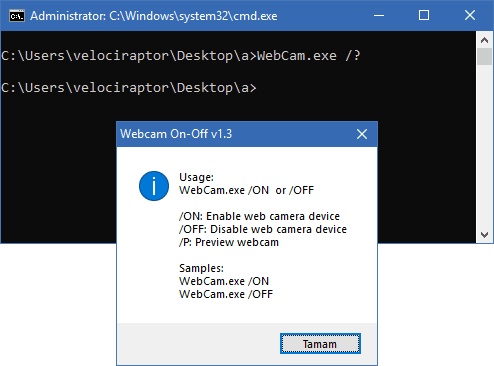 WebCam On-Off Software V1.3 software serve the purpose to operate its functioning in finger tips regarding enabling, disabling zooming, taking snapshots etc as when you want. As you know very well that Webcams helps you to stay informed with family and friends, or perhaps record and stream video from your computer to the internet or to a file. Due to Security Reasons, this program is also can be used so that you may able to know the factual position of destination location. You are also When not in use , you may wish to disable your webcam to know that it is not making unwanted recordings. 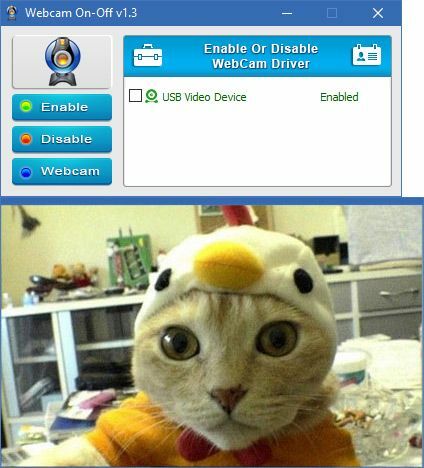 Sometimes, it may be used by malware can take over webcams, so there is potential for spying. In this situation you want to know the same about status of its on-off. Hackers can utilize trojan-horse attacks, enabling them to take control of your webcam, allowing them to record you or take pictures of you without your knowledge. Want to know its operating and functioning, just download and extract the ZIP file to the folder of your choice, then run the program. You can see status of your webcam in the list as display. Just you can disable, enable by using its buttons. After disabling it, you can check its status in an application that would normally use it. You should see a ‘no device found’ error. You can also open Device Manager and check for your webcam device in the list. Moreover, if you doubt either your webcam has been disabled on may not be! the text and indicator icon will turn red. Webcam On-Off can also serve as a portable webcam viewer. To use it as such, just click the Webcam button. You can use it to snap a picture, and also use zoom in and zoom out. There is a settings button as well.